Hey! Quick question here - I was browsing your site and came across your "Pruning Succulent Plants" page, and recognized the plant you have on the title banner. I was given a cutting of this plant from a friend and it's growing excellently, but I have no idea what it's called. Help a fellow plant mama out with the name of her baby? This is one of my favorite plants, and it took me a while to find out what it was too. I finally narrowed it down, and settled on Senecio mandraliscae, which still seems to me to be not quite right, but it's so close. And the description of it is bang on. One thing no-one else seems to mention is the smell of the sap if you break a branch, but it's almost pungent and resinous, rather like a pine tree. That to me is the deciding factor with this plant (and I have been known to pluck a leaf and crush it, just to inhale the scent!). I have two of these plants (which I believe are Senecio mandralisca), that have grown enormously tall, I want to say 2 feet in height and very healthy. Any ideas on how to maintain them? Do I just need to cut them back? They are so tall, I am going to need a larger pot for the base so they won't topple over. These plants don't mind being cut back, in fact, it just causes them to get much more bushy and compact. Plus, you can root all the pieces you cut off for more plants! 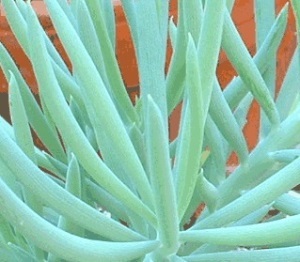 More on pruning succulent plants here.